Daniel Mark Duffy is an Irish American Painter and Draughtsman. In his youth, Duffy studied classical painting and drawing techniques with Carroll N Jones,III and received scholarships from Pratt Institute and Carnegie Mellon University where he received a BFA in art history and studio arts. Upon graduation his unique drawing skills earned him a position in the Department of Vertebrate Paleontology at the American Museum of Natural History, New York. A decade of freelance commercial projects followed for advertising and publishing companies that included over 100 award-winning young adult and children's books. 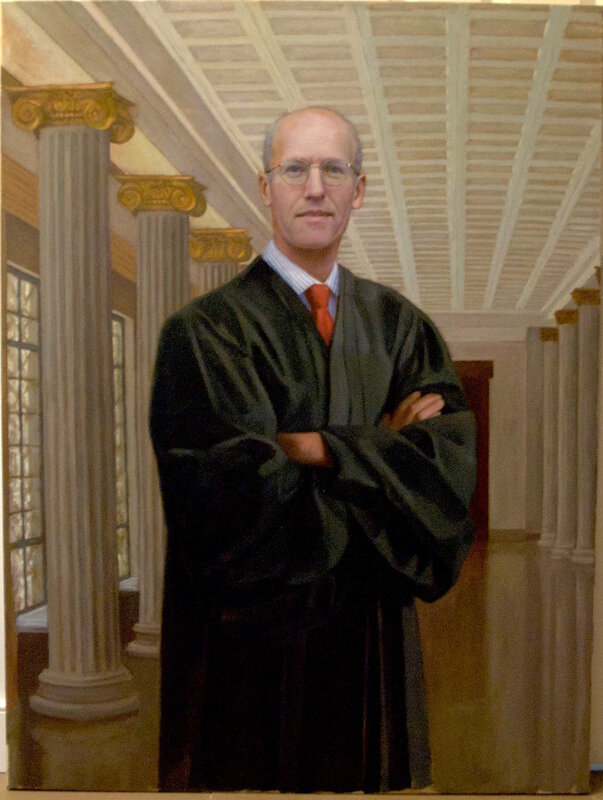 His reputation and expertise garnered commissions to paint the official portraits of many distinguished citizens including the leaders of American Universities, Colleges and Corporations, public servants in US Federal Government and the State and Federal Judiciary. Duffy's work has been included in group exhibitions in New York, Washington, DC, Miami, Berlin, Florence, Dublin, Belfast and London and has been featured in the collections of United States, National Portrait Gallery and The Royal Hibernian Academy, Dublin. "I am deeply impressed with Dan's artistry – with his ability to produce marvelous likenesses and to depict expressions and postures and imaginative settings that capture the spirit and character of his subjects. He brings to his work a powerful combination of aesthetic skill and high intelligence, coupled with an eagerness to develop a keen understanding of those he is painting." "I doubt you have ever thought of yourself as [a] historian or a cultural anthropologist, but you are, in addition to being one of the finest artists I have ever encountered… The Yale Law School, with you as our guide and interpreter, is acting to capture and preserve the essence of its legacy for the mid to late 20th century. Because of your great talent for rendering those who embody our best institutional values, there is now a greater hope that our noblest traditions will be known and understood by future generations. Adjunct Professor/Lecturer in Fine Arts, Paier College of Art, Hamden, CT 2005 - 2012. Daniel Mark Duffy and the portrait subject/ client meet to consider preferences, time frame and budget for each portrait painting or drawing. Daniel welcomes clients to his beautiful Weston, Connecticut studio or schedule a photography session in New York City or your home or office. The details of the project, including scale, tone, composition, attire and venue will be discussed prior to the sitting. It is requested that the subject pose for a certain length of time for sketches, color studies and a photography session. Daniel Mark Duffy insists on at least five 3 hour live sittings or a single 2-3 hour sitting that includes a photography session to complete a single portrait painting. A minimum of 2 but ideally 6 months are needed to frame and deliver a major portrait in oil on canvas. Once the portrait painting is fully realized, DMD may request a final sitting to address requested changes or make color adjustments. Your completed portrait may be either shipped or personally delivered. DMD will provide valuable assistance with framing, presentation and installation of your portrait painting.